December 27th in Plugin Lists, Wordpress Plugins by Wordpress Jedi . 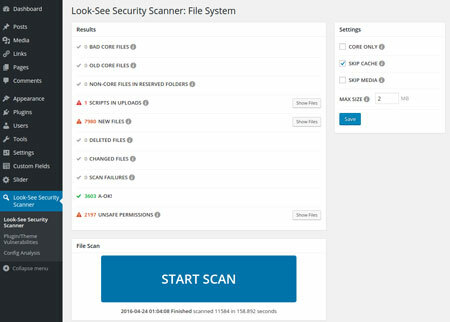 Look-See Security Scanner: this plugin verifies the integrity of core WordPress plugins. Checks uploaded themes and plugins against WPScan vulnerabilities. Plugin Vulnerabilities: displays an alert when an installed plugin has a vulnerability you need to address. No Longer in Directory: tells you which plugins are no longer in the WordPress.org Plugin Directory. 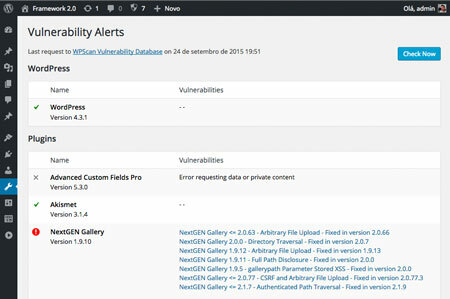 Vulnerability Alerts: this script scans your system against WPScan database and lists issues with your plugins and themes. Vulnerable Plugin Checker: another plugin that uses WPScan’s API to detect vulnerabilities. It sends email alerts, so you can address security issues fast. Plugin Security Scanner: alerts you if you have plugins with any security vulnerabilities. It runs once a day and e-mails you if there are any issues. Have you found better security plugins for WordPress? Please share them here.